Congratulations to Georgie Howell, Joe Greaves and Marcus Harvey on a superb Championships! 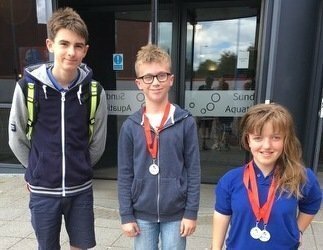 Georgie, Joe and Marcus had to travel to Sunderland Aquatic Centre for the National Junior Para-Championships. They competed in their disability category in two age groups: 10-13 or 14-16yrs. Marcus was our youngest swimmer at age 12. He swam in 3 events in the S14 category winning Gold in the 100m breaststroke and 100m backstroke; Silver in the 50m freestyle. All were PBs, a massive 33 seconds on his 100 back!! Joe, also an S14, has only just had his 14th birthday and swam in the 14-16 age group. It was also a larger age group. With PBs in all 4 events, having only competed two weeks ago at the H&W open meet, Joe finished 8th in the 100 back, 9th in the 50 free and 200 free and 10th in the 100 free. Joe also did a big PB on his backstroke at 14 seconds! Georgie, age 14, is a very experienced S6 swimmer. Georgie swam PBs in all except one of her 7 events, winning Gold in every one!! Results were also published for multi-disability by points. 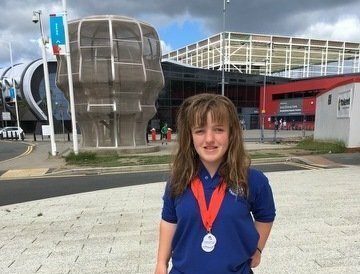 Georgie’s best result saw her achieving 698 disability points on her 100m breaststroke, finishing 2nd overall. Fantastic swimming guys, we’re all really proud of you! Next: Next post: Euan nets his final Scottish time!